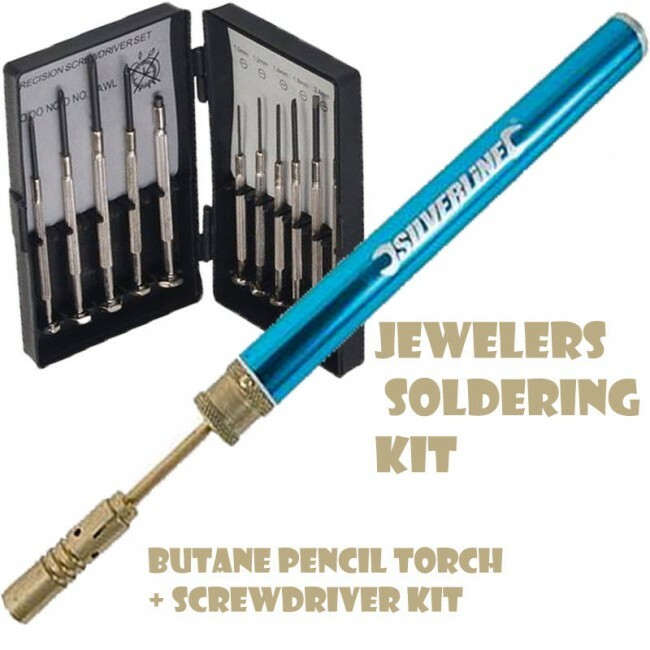 JEWELERS SOLDERING KIT BUTANE PENCIL TORCH AND PRECISION SCREWDRIVER SET Includes Pencil torch for soldering, jewellery-making and jobs requiring accurate heat application. Variable gas flow control. Gas not included. Includes Jewellers Screwdriver Set 11pce Hardened and tempered steel blades. Hexagonal swivel heads. Includes Phillips: PH00, PH0, PH1; slotted: 1.0, 1.2, 1.4, 1.8, 2.4, 3.0mm. 1 x scratch awl and 1 x magnet.